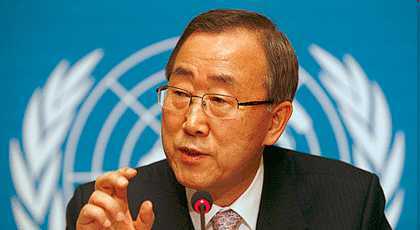 Ban Ki-moon. Nice man, a careful diplomat (flatters New Zealand), but obviously no scientist. Head of the UN, outranks the famous panel on climate change (IPCC) but never consults them. Because he still hasn’t found out that sea levels aren’t threatening the coral islands. He’s even been to Kiribati, but he still didn’t find out. We’ve covered the coral-islands-in-great-danger-from-rising-seas theme many times. But something isn’t working — could it be the brains of certain people, like most of our reporters, the head of our nascent world government and the official NZ climate scientists at NIWA, who let everyone tell the most outrageous fibs in public without correcting them? Coral islands began forming at least 250 million years ago and some of them are a million years old, although many are from 5000 to 10,000 years old. In the 20,000 years since the last Ice Age, sea level has gone up about 130 metres (426 ft). That’s a long way to fall. Yet, amazingly, coral islands are still on the surface. They kept up with the rising water. Well, some drowned, but not (of course) the ones that are left. Globally, sea level rise for the past 8000 years, as the Ice Age ice melted, has been about 1.8 mm per year. But coral reefs grow from 10 mm to 20 mm per year. So the reefs and islands are having no trouble keeping up with the rising water. He said the Pacific region was on the “front lines” of climate change and he praised New Zealand as a leader in promoting sustainable energy solutions. Paul Kench at the University of Auckland in New Zealand and Arthur Webb at the South Pacific Applied Geoscience Commission in Fiji released a study in 2010 on the dynamic response of reef islands to sea level rise in the central Pacific. Kiribati was mentioned in the study, and Webb and Kench found that the three major urbanised islands in Kiribati – Betio, Bairiki and Nanikai – increased by 30 per cent (36 hectares), 16.3 per cent (5.8 hectares) and 12.5 per cent (0.8 hectares), respectively. This would be impossible if sea level had risen. This local research was only recently announced, so how was the Herald and TVNZ deceived into thinking the 32 coral atolls comprising Kiribati were shrinking? I challenge our intrepid, hard-working reporters to find the web site of the South Pacific Sea Level and Monitoring Project. HINT: the link is somewhere in this paragraph. Try to find Monthly Data Reports. Click the link. a) The stupid claim from Mr Ban of imminent inundation. b) Your organisation’s latest report on Kiribati. If Mr Ban, who is so close to the IPCC and its reports, cannot understand a couple of basic facts about sea level and about coral islands, he shouldn’t be in the job. If trained reporters, who let Mr Ban and the Kiribati president, Anote Tong, say what they like without elementary fact-checking, they shouldn’t be in the job. If NIWA scientists, who hear these public statements and make no correction, because it suits their agenda of alarm, even though the facts being advertised are demonstrably false, they shouldn’t be in the job. Why is just this one lonely blog refuting stupid statements made in New Zealand by the head of the UN? Where is everyone? Good article, Richard, and a very sad comment on the state of the New Zealand establishment’s grasp of the natural sciences, particularly the MSM. I was very lucky to have a father with a voracious thirst thirst for knowledge and a passion for public libraries and for buying books, who encouraged me to read widely on all sorts of diverse topics and eventually left me the nucleus of an excellent personal library; my high school teachers used to berate me for my reading habits and for ignoring their dismal and incredibly boring set homework. Darwin, from his observations made on the long, long voyage of HMS ‘Beagle’, pretty much defined the evolution of coral islands and their relationship with sea levels. This knowledge has been verified beyond doubt and has been out there in the public domain for a very long time. Darwin’s writings should be on the reading list of anyone who is at all interested in the natural sciences, or, indeed, any person who considers themselves to be ‘educated’. The history of a number Pacific Islands, whose governments are generally enthusiastic about grasping economic phantoms and morally dodgy enrichment schemes, to the detriment of their long-suffering peoples, is also well documented. I suspect that the likelihood of Ban Ki Moon being poorly educated or an idiot is quite small, therefore nasty suspicions about his motivations and ethics arise from his ridiculous statements on this matter. The Herald wrote about Paul Kench’s report in June 2010, perhaps they forgot or did not like the results. Very happy to know there are other outraged sceptics in NZ. I am equally non-plussed that this nonsense is continually trotted out day after day without any shame or challenge from those who should. All that is necessary for the triumph of evil is that good men do nothing. Don’t let fibs go past. A couple of years earlier the Broadcasting Standards authority lambasted TVNZ for a sensational story about coral islands being drowned by rising sea levels. So they know this is all garbage, but they keep on dishing it up. Why? Is this deliberate deception based on politics or religion – a breach of the Broadcasting Act? Or is it aimed at increasing profits – an offence under the Fair Trading Act? The world’s most senior bureaucrat is opposed to economic development! He is another “deep green” who listens to the mauri of the oceans telling him that mankind has become a parasite on the planet. He wants to lead us to a new paradigm, where money is less important and we all move closer to nature. Why doesn’t he spell out his alternative model in detail? Why don’t we vote on it? How many times does this Moon-shine need to be rebutted? You can lead a hack to water but you can’t make him think. Lord Monckton is correct, journalists out there dont check the stories. Come on all those journalists out there INVESTIGATE and prove Lord Monckton Wrong. I haven’t heard of him, Andy, do you have more info? Vote? Oh, you think this is a democracy! He is President of the European Commission, since 23 November 2004. He served as Prime Minister of Portugal from 6 April 2002 to 17 July 2004. He is a Euroslime, decides nothing,does nothing, has a big salarry, no doubt with bonuses and tells other countries what to do. Richard T, Barosso and Moon are but parts of the cartel, hell-bent on impoverishing the Western economies by their mad ‘decarbonisation’ scheme and any discredited and well-used BS will do to keep our dumb Kiwi politicians on their side. As I said earlier, I recently spent a week in the far reaches of the Czech Republic and the average Czech working bloke’s hold on Western-type affluence is newish, slender, but tenacious. The Eurocrats and the UN are regarded there as arch-criminals, similar to the Russian mafia but with less flashy suits. Another very old variant of ‘leading a horse’ etc is ‘you can lead a whore to culture but you can’t make her think’. If this seems somewhat unseemly, for some reason, ‘journalist’ and ‘whore’ seem to be interchangable work definitions throughout the MSM. In my coastal area (Northland) it does appear that spring tides are increasing, i.e. high water springs are higher and low water springs are lower than say ten years ago. Is there some astronomical explanation for this. Does the moon’s orbit vary over time? Planetary alignments? Doubtful. Earth’s proximity to the sun varying? Could it be la nina effects? Is it just a local event? While the changing tides are my own observation other people in close proximity to the Northland littoral have also commented on this. Can you estimate the height differences from ten years ago? I don’t know what could alter the tidal range. I wouldn’t think sea level changes could do it, but maybe changing currents? Some places have tidal ranges of many metres. If that’s caused by topography or local gravitational effects, the range wouldn’t change much. I’m wondering why the NZ Herald has been publishing a string of articles lately stating that Pacific island nations are at risk of rising ocean levels when the scientific data plainly shows that for the majority (8 out of 12, including the much publicised Kiribati & Tuvalu) it definitely is not. Perhaps you’d like to actually do some research next time you try your hand at journalism. Additionally, in the following scientific paper – Kiribati is at the bottom of page 11, Tuvalu at the bottom of page 19 of the following scientific paper. J M Barosso, K M Ban, and Connie Hedegaard are all taking an unusual interest in the Pacific Forum because the ‘Small Islands Group’ are very influential at COP meetings. Both the EU and UN are intent on raising lots of money at the COP17 meeting in Durban. That is their justification for flying to Auckland in private jets, emitting lots of CO2. But their real interest is to attend the RWC festivities. The same bit of Moon-shine featured in Waikato Times last night. After this stuff has been published once the responsibility for subsequent editors to give it any sort of test for reasonableness or factuality seems to be zero. Let’s hope the Euro collapses before this can happen. There are tidal constituents with periods longer than a year. One key one has a period of 18.6 years, so tides increase and decrease in size over this time. It is one of the stores that cause issues for sea level rise analysis and if not removed it causes apparent accelerations and decelerations in the rate of sea level change. More important though for Northland will be El Nino and La Nina. Sea level tends to fall during El Nino and rise during La Nina. We are now seeing a rebound to La Nina conditions, making this a double-dip event and the strongest La Nina since at least 1917. You will observe this as higher spring levels. However, the data I have for Tauranga indicate that tidal range is not much different at present. What a delight to see you here, professor. Thanks for cleaning up my tidal guessing game! I don’t suppose this will get much media coverage thanks to the Rugby. Bullseye!!! Please advise if there is any sort of response. Well done!! Ban Ki Moon and the Secretary-General of the Pacific Islands Forum have recently claimed that serious sea level rise problems occur both in Tuvalu and Kiribati. This is what two misguided politicians may say. But what is the reality, we must ask. The answer is clear and straight forward: the is no sea level rise going on – at least for the last 18 years – either in Tuvalu or in Kiribati. So, if our observational facts say: no rise in sea lever, why are people continuing to drive the sea level rise illusion. It doesn’t become better (rather the opposite) if you are the Secretary-General for the United Nation or Pacific Island Forum. It is simply wrong. But what is worth; it steals the limelight from real problems in the real world. The same is true for Kiribati. It lies in an area of the SW Pacific where satellite altimetry proposes a sea level rise in the order of 5 mm/year. Gray (2010) showed that this does indeed not concur with the last SEAFRAME tide gauge record from Kiribati (Fig. 3). The record spans 17 years. Still, it does not record any long-term sea level rise; just a stability. Obviously, there is a major clash between scenario based computer simulations and reality in the form of observational based facts and observations in nature itself. Therefore, there are all logical reasons to turn away from the propaganda information and concentrate all attention and interest on observational facts. In this case, those facts give a very clear and irrefutable message; there is no alarming sea level rise either in Tuvalu or Kiribati. Ban Ki Moon and his friend from the Pacific Islands Forum should both feel ashamed of their claims and statements with respect to Tuvalu and Kiribati. As far as I can gather the TOPEX/Jason global data from USA is baloney but I accept (pragmatically) that it will be the source-of-choice for agenda based communications and we will just have to go with it. The flip-side being that its decelerating. Give me tide guage (or Euro Envisat satellite data if pushed) any day. ‘Not correctly briefed’ is a polite way to put it. Personally I think they’re straight out lying. A recent geological study led to widespread media reports that low-lying Pacific islands are growing rather than sinking. Thousands of stories reached every corner of the globe with news proclaiming that atoll nations were not under threat from rising sea levels. Yet an author of the study says that this is untrue. ‘Our research does not provide any evidence that larger atoll islands are capable of vertical growth, we do not suggest this is occurring’ says co-author Dr. Arthur Webb. Together with Paul Kench, Dr. Webb co-wrote the article ‘The dynamic response of reef islands to sea-level rise: Evidence from multi-decadal analysis of island change in the Central Pacific’ that contained revolutionary findings regarding the horizontal growth of Pacific islands gained from studying satellite images. ‘Aside from the paper I sadly see no evidence of substantive vertical growth in any larger atoll islands. Thus atoll island susceptibility to inundation through sea level rise remains unchanged – i.e. all low lying atoll islands are directly threatened by sea level rise given their land elevation is very low and rates of sea level rise are increasing’ summarises Dr. Webb. ‘It has greatly saddened me that the research has been so poorly presented by the press and that in some cases it has been wilfully and cynically miss-used’ concludes Dr. Webb. Fair enough, the paper doesn’t address the issue of vertical growth. However, if Dr Webb thinks coral atolls are at risk of inundation now, when sea level rise is minor (and, for the last two years, negative), how does he explain their survival during an episode of sea level rise of about 130 metres? Inner hydraulics? He finds no evidence of coral atoll vertical growth (but has he been looking for it?) but I wouldn’t expect to see evidence of vertical growth until the sea level actually rises, since that should be the trigger the coral responds to. As sea level rise over the last 17 years, according to the Colorado University Sea Level Research Group, has been about 50 mm, we should look for about that amount of vertical growth in the coral. But it’s not much, so would we find it? I think we should keep looking.